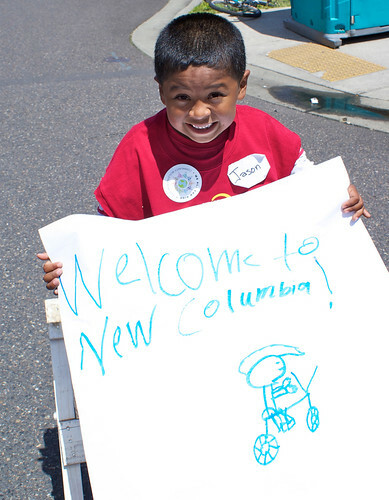 According to the City of Portland, roughly 23,700 people showed up for the North Portland Sunday Parkways on June 24th. 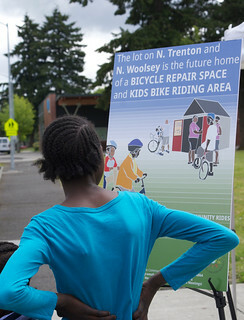 We spent the day with We All Can Ride, New Columbia’s bike committee, in a lot on the corner of N. Trenton Street and N. Woolsey Avenue in the heart of New Columbia, while the Northwest Trail Alliance set up a skills park that was very popular among the residents and Sunday Parkways attendees. 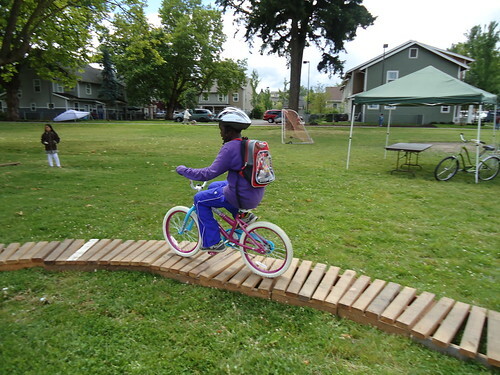 The Northwest Trail Alliance drove their truck and trailer to the lot, full of wood ramp pieces that can be laid out in a variety of ways to create a path of ramps, obstacles and teeter boards. Neighborhood kids quickly assembled to help unload the giant Lego-style wood pieces. With direction from Northwest Trail Alliance’s Raul Atencio, they built an awesome course on the grass. By 11 am the course was ready for the kids to test out. Charles Robertson, a New Columbia resident and We All Can Ride leader, had assembled a very large group of kids to be “Intersection Superheroes” at the corner of Trenton and Dwight. The intersection team came up with a chant of “Welcome to New Columbia! We All Can Ride!” which they shouted as bikers rounded the corner. We are in the process of working with Home Forward and a design program at PNCA / OCAC to build a bicycle repair space and kids’ bike riding area on the lot at N. Trenton and and Woolsey. The North Portland Sunday Parkways event served as a great opportunity to get feedback from residents about what type of infrastructure they would like to see in their neighborhood. Egbevado Ananouko (We All Can Ride leader) and I were stationed at the outreach tent with Bike There maps, Community Cycling Center brochures, our awesome bike project poster, tools, pumps, sign up sheets and blank poster paper so that residents could give input about what they would like to see on the lot later this summer. We even met a woman who lives in the house right behind the lot, and she was very excited about the upcoming projects. She noted that there are 36 children living in the the small quadrant of houses right behind the lot that would enjoy having this new space for bicycles. There was a huge line for the Northwest Trail Alliance’s skills park all day long, and the residents and I kept asking the neighborhood kids if they had “ridden the ramps” in the park. That seemed like the best way to describe the skills course, and every kid loves a “ramp” so it worked really well as an outreach strategy. Every time a kid successfully rode over the really skinny sections without riding off course, the entire crowd and the two Northwest Trail Alliance staff members cheered loudly. A few of the local kids decided to stay at our booth all day, and were very excited about pumping up low tires. We did an impromptu flat tire lesson, and they were thrilled. They spent the next four hours soliciting riders who had low tire pressure to come over and get free air from them. They had a sales pitch, and strategically placed themselves on opposite corners, yelling “AIR! MAPS!” while waving their arms. We decided to write this pitch with the sidewalk chalk right in the middle of the road, so that everyone could see where the air and maps were. I have a feeling these kids and many others will be regular volunteers at the future bicycle repair space once it is built. Two of our trained ride leaders, Charles Robertson and Michelle Hanna, led community rides for kids with Gabe Graff and Carolina Iraheta from the City’s Safe Routes to Schools Program. They had so many neighborhood kids interested in the ride, that the last ride didn’t even make it back to McCoy Park until 4:30pm, after Sunday Parkways had ended! A couple of the Bike Club kids from the Boys and Girls Club Bike Club that we led this spring were there, and participated in the ride. They were super excited to see us, and are still enjoying the bikes that they earned through our program. All in all it was a sunny, energetic and exciting day. Everyone had a blast filling tires with air, riding all over the skills course, smiling for the camera, and chatting about future bike projects in the neighborhood. 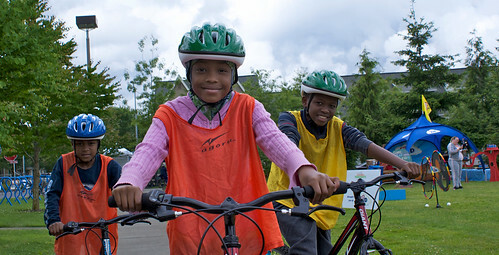 To view more photos from North Portland Sunday Parkways, click here.